On Thursday evening, in the midst of the frenzied scramble of the last day of the transfer window, the South American qualifiers returned to Brazil with a bang, the Seleção overcoming Ecuador 2-0 with a slick second half performance in Porto Alegre. Goals from Paulinho and Philippe Coutinho secured the victory. Before the game much of the Brazilian media attention had been focused around one of the men slap bang in the middle of the aforementioned transfer tumult, Liverpool’s Philippe Coutinho, subject of much speculation linking him with a move to Barcelona. The player’s doctor had laughably declared him fit for the game, saying that the supposed back problem that had kept him out for Liverpool was due to stress caused by the proposed move and had been miraculously solved by that well known cure for lumbar pain, a 13-hour flight across the Atlantic. Unsurprisingly, Tite decided to start with Coutinho on the bench given the fact that he is yet to take to the field at club level this season and the excellent form of Willian for Chelsea. There was only one other change to Tite’s favoured starting XI, Thiago Silva entering in the place of Miranda at the heart of the defence at half time after Miranda took a blow to the head. The Brazil coach opted to increase the understanding between his preferred starters rather than giving chances to reserves such as Roberto Firmino, Giuliano and Fernandinho or new call-ups like Grêmio star Luan. Ecuador went into the game in sixth place in the qualifying table, two points behind Argentina who occupied the play-off place and three behind Chile who lay in the final automatic qualification spot. They were, then, desperate for a result and travelled to the southernmost state of Brazil hoping that the already-qualified Brazil would have taken their foot off the gas. If that was the case then they would have been disappointed, Brazil starting brightly and creating two chances in the opening ten minutes. First a Gabriel Jesus backheel found Paulinho, a player who Barcelona have managed to sign, who wriggled his way into the area only to see his shot saved by Banguera. Moments later Willian sent a low, side-footed effort just wide from inside the ‘D’ of the penalty area. Ecuador showed their willingness to concede possession from the beginning, allowing Brazil to have the ball in front of them and looking to use the pace of the two Valencias, Enner and Antonio, to counter quickly. After 33 minutes Brazil’s pressure brought another opportunity, the lively Jesus turning into the area and firing a low shot that was tipped around the post by Banguera. Apart from that, however, the Ecuador defence held firm. The game, owing to the extortionately high ticket prices, was played in front of a half-empty Arena do Grêmio. The cheapest ticket, to stand on a concrete terrace behind the goal, cost 160 Reals, almost a fifth of the monthly minimum wage in Brazil. A ticket for a seat at the side of the pitch would have set you back 350 Reals. At the start of the second half Brazil’s frustration with the packed Ecuadorian defence became clear. Neymar started to play as a one man team, trying to dribble around the entire Ecuador team when a simple pass may have been more appropriate. Soon afterwards Tite shouted to his charges to get the ball into the box earlier, which proved effective. Gabriel Jesus pulled off the back of his marker and managed to direct a header on target from a deep Daniel Alves cross, only to see the ‘keeper save once again. As spaces started to appear in central areas Tite introduced Coutinho in the place of Renato Augusto to provide more attacking invention. Rather than playing on the right drifting in, like he has in previous games, Coutinho entered in the number 10 role, given licence to come deep and pick up the ball from Casemiro and Paulinho. 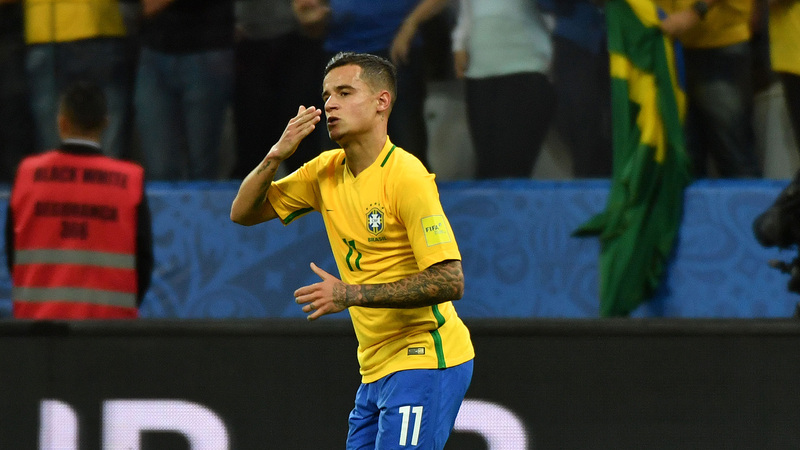 Shortly afterwards Brazil opened the scoring from a corner won as a direct result of Coutinho’s creativity. Willian delivered a wicked ball which evaded the Ecuadorian defenders and fell at the feet of Paulinho. The power on his shot was this time enough to beat Banguera. From this point on Brazil well and truly took control and started to come flooding forward. A rapid pair shots from Willian and Neymar forced a fine double save from the increasingly busy Ecuadorian number one. Ecaudor reacted with two attacking changes, bringing on Felipe Caicedo and Juan Cazares, but this merely had the effect of opening more space for the Brazilian attackers to work in. Coutinho soon took full advantage, showing why Barcelona were so keen to secure his signature. He picked the ball up on the half way line, playing a one-two with Marcelo and driving forwards, bypassing the Ecuadorian midfield. He lifted his head to spot Jesus making a darting run in behind the back line before dinking a delicious chipped pass over the defence and into the path of the Manchester City man. Jesus flicked the ball over the centre-back and headed it back towards Coutinho, who had continued his gliding run towards the six-yard box and calmly stroked the ball into the net on the half-volley. It was a truly wonderful piece of percipient, incisive football. After the goal, which made sure of the three points, the yellow shirts of the Seleção continued to dart forwards menacingly with Coutinho finding some terrific, defence splitting passes. They were unable, however, to add to their tally of two. Ecuador, on the other hand, became increasingly disjointed as the half wore on. A weak Caicedo header was the closest they came to troubling Alisson in the Brazilian goal. The result takes Brazil onto 36 points, 11 ahead of second-placed Colombia with three games remaining, and makes it nine wins out of nine for Tite in competitive fixtures. The manager will certainly have been pleased with the way his team persisted, showing relentless attacking intent even when faced with a stubborn opposition. The successful introduction of Coutinho in a central role also provides an interesting tactical alternative to take to Russia in 10 months time. Elsewhere on the continent, the most hotly anticipated fixture of the round was Argentina’s trip to Montevideo for the River Plate derby, Jorge Sampaoli’s first competitive game in charge of La Albiceleste. Unfortunately the game never really got going and ended in a hard-fought but surprisingly low quality 0-0. Sampaoli’s team played in his favoured 3-4-3 but were unable to knit together any real slick passing moves. 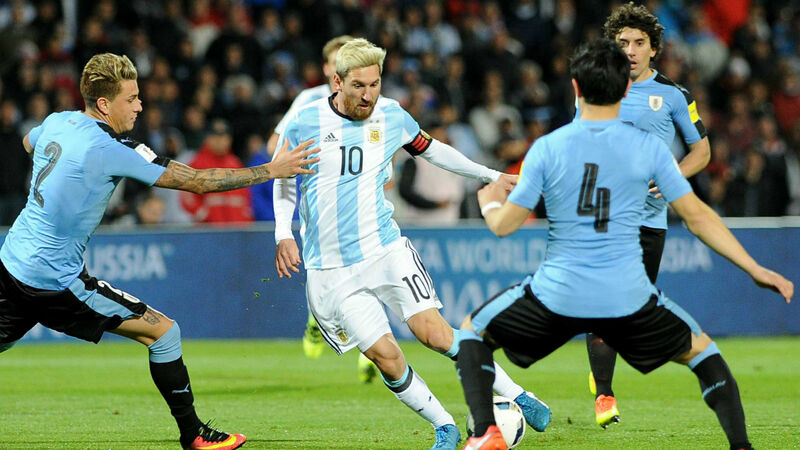 There were a few moments of inspiration from Messi but the new Argentina coach would have been disappointed with the performance, especially that of his central midfield pairing of Pizarro and Biglia who failed to break the resilient Uruguayan lines. The stalemate was perhaps not a surprise when you consider that the Uruguay defence has been playing in the same way for ten years and the Argentina attack has had fewer than ten training sessions to get used their new style. The result will not have pleased either side. Colombia travelled to Venezuela in a battle of second against last in the table, another game that ended in a goalless draw. The game got off to a horrible start with neither team managing to work the ball from the midfield to their forwards. After thirty minutes, however, it exploded into life with 19-year-old rubber-limbed Venezuelan goalkeeper Wuilker Fariñez saving from Falcão and the home side rattling the cross bar with a Josef Martínez thunderbolt from 23 yards. In the second half it was more of the same, with Fariñez and David Ospina the outstanding players on the pitch. There were plenty of shots from both sides but the goalkeepers produced a series of decent saves to keep it level at nil apiece. Meanwhile, Chile went down by three goals to nil at home to Paraguay. Arturo Vidal opened the scoring with a spectacular diving header into his own goal. In the second half the visitors extended their lead through Caceres before putting the game to bed in the final minutes when Ortiz finished off a swift counter. The pressure is mounting on Chile coach Juan Antonio Pizzi. In the final game of the night Peru moved within touching distance of the qualification places with a 2-1 win over Bolivia. Peru’s Cristian Cueva scored a marvellous long-range strike just four minutes after Édison Flores had opened the scoring early in the second half. Bolivia pulled one back with a well-taken lob from Gilbert Álvarez but it was not enough. On Tuesday, Uruguay play Paraguay in Asuncion, Argentina host Venezuela in a must win game, Brazil go to Barraquilla to play Colombia, Bolivia play Chile in La Paz whilst Ecuador take on Peru in Quito. This qualification competition is going down to the wire.